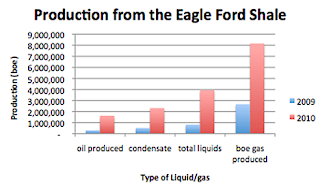 There are two figures that keep cropping up when folk write about the production of oil, one number is the daily flow rate for crude oil, and while the EIA report that the peak production year to date was in 2005, when the world produced 73.72 mbd, the IEA have reported that the peak occurred in 2006. Yet just last week the IEA raised their forecast for next year’s oil demand to 88.8 mbd and there is about 15 mbd difference between the two numbers. So you might ask what causes this, where do these additional liquids come from and what is their future, relative to that of crude alone. Part of the answer comes from what are known as refinery gains, the fact that when you crack a high-carbon crude into lower carbon products in a refinery then there is a gain in volume. In Oil 101 Morgan gives this processing gain in volume to be around 2.2 mbd. In addition there is the rising level of bio-fuel production, about 900,000 bd of ethanol in the US alone, for example. But the largest volume comes from the liquids associated with the production of natural gas. These are collectively described as Natural Gas Liquids (NGL) and condensate. Simplistically, when natural gas comes out of the reservoir it is not always what is referred to as a dry gas, but rather can often contain a number of other constituents in the fluid flow. The NGLs are normally a combination of ethane, butane, isobutene, propane and natural gasoline and are normally combined with other light hydrocarbons that condense out of the fluid flow at the surface, when pressures and temperatures fall from those in the reservoir. These additional fluids are the ones generally called condensates, as a result. (The NGL's need a little pressure to re-liquefy). NGL total volume is about 8 mbd. Now to make life somewhat more complicated both oil and gas can come out of the same well at the same time in a admix that can include all of the above. And that requires that they be separated, but that is a topic for another day or two. Today I want to give an example of the importance of those liquids that lie between crude and natural gas. These mixtures can be more important, depending on the relative composition of the flows that are then obtained. 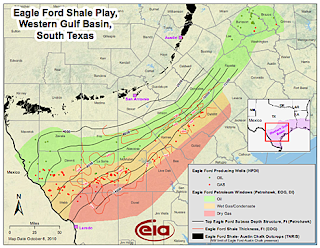 Consider, for example, the Eagle Ford shale, the new field that is being developed in Texas, where wells that are to be drilled into the gas shale are now touted for their liquids content, rather than for the natural gas that they are more commonly anticipated to produce. 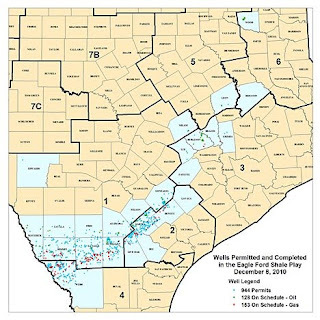 When the field was first drilled, back in 2008, the initial well flowed with natural gas production of 7.6 million cf/d and there have been some 944 permits for wells as and of last week. As a rough rule of thumb down to 15,000 ft the hydrocarbon is more likely to be oil, (which is thus referred to as the Oil Window) and below that it is more likely to be gas. That is only a rough rule of thumb, and one must remember that over time there has been a lot of uplifting and eroding, so that 15,000 ft isn’t necessarily what it used to be. 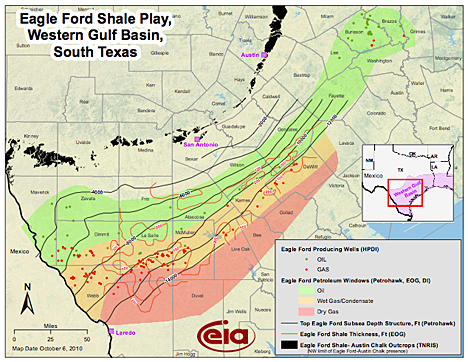 And the Eagle Ford shale is a fairly good example of this. If we use the EIA map of the play you can see that in the North, where the reservoir is about 6,000 ft deep the hydrocarbon is oil, while further South, where the deposit is down at around 14,000 ft then the hydrocarbon is dry gas. And in between it is what is known as a wet gas. You may note that the condensate from the wells in the wet gas zone have produced around 2.3 million barrels, while there has only been about 1.6 million barrels of crude produced. It is also worth noting that while the natural gas coming from the formation has been twice the equivalent volume of oil, the market for natural gas, at the moment is still down at around $4.6 per kcf, which using the Apache conversion, would give it a price of around $27.60 a barrel of oil equivalent. On the other hand the condensate is a light high quality product, and West Texas Intermediate crude is running at the moment at around $88.30 a barrel. (EIA last Natural Gas Weekly ) You should also remember that these are not the retail price for the products – natural gas in Florida, for example, was given as $10.56 per kcf, while it is around $9.81 in New York (ibid). The current excess of natural gas over supply, which is likely to continue through at least next year (and which I will discuss in more detail in a number of future posts) will likely keep the price of natural gas down around the $4 figure through most of next year. On the other hand the increasing demand for oil when set against the limited ability of the industry to respond, will likely mean that oil may well move over $100 a barrel. 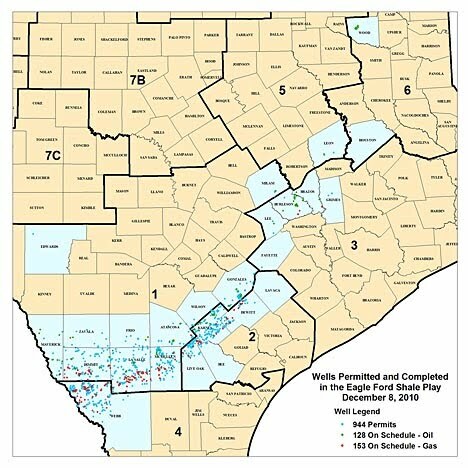 So now you know why they are drilling in the middle of the play known as the Eagle Ford Shale. One thing about photosynthetic organisms -- they have been converting immense quantities of CO2 into organic carbon for over 3 billion years. 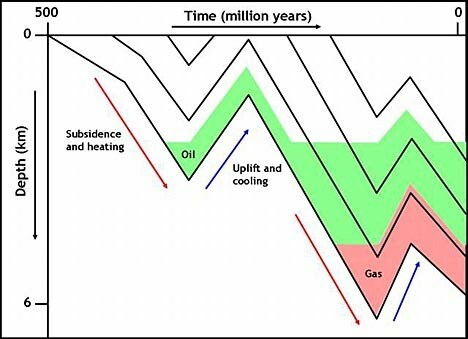 If you look at the graphic of atmospheric gas composition over time juxtaposed to evolutionary origins of various unicellular and multicellular photosynthetic life forms, you will get an excellent time sense of carbon conversion and oxygen generation. My point? There is a lot more organic carbon sitting around in Earth's crust than modern analysts appear capable of imagining. Even in non-oxidising parts of Earth's mantle, hydrocarbons can apparently survive (and regenerate) over long periods of time. 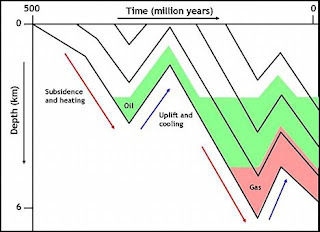 Sure, a lot of it was oxidised and blown out into the atmosphere, but . . .How much of the billions-year old organic carbon in the crust may be in the form of pre-oil or pre-gas (or pre-coal etc) because it has not gone deeply enough into the crust for full conversion? Or how much of it is methane hydrates -- a resource which has barely begun to be mapped?